If you want to play in your own symphonic metal band, you have to find some good lyrical themes for your music, otherwise you can't simply catch people's attention, which in other words means: no fans for you, loser! A good choice of lyrical themes for a symphonic metal band's music is usually a combination of any dark themes like sorrow, anger or hate, pain, death, loss, loneliness or sins (possibly all the seven deadly sins) and, of course, also darkness itself. It simply has to be dark. Get it? DARK! And if you want a little change sometimes, you can also choose from less dark themes, like for example: love, innocence and maaaayyyybe (but just maybe) nature and wilderness. But don't change themes of your music too often. If you do feel the pressure still because you want your songs to be a bit varied, combine the less dark themes with the darker ones like this for example: A song about love can be combined with death, loss, loneliness, sorrow and pain, so the story line of the song could be "I lost my beloved one, because he died and now I feel lonely, sad and psychically hurt". Emotions are desperately needed. And don't forget to make it sound really poetic. As someone with a symphonic metal band, you definitely have to use elements of classical music. It is absolutely vital that you compose at least one more-than-seven-minute long song for each album. And forget melodic schemes and clear arrangements - it's OK in case of shorter songs, but when it comes to long songs, it gets boring with every minute. So make it long and melodically various (put the song together from a couple of different melodies). Yes, it's necessary, because it will remind people that are difficult to compose, so to compose something that difficult people will think that you must be very intelligent and talented. In other words, if you compose something long and varied, it means you are very talented and intelligent (Even if you're not, but who can judge you? It's not like a regular symphonic metal fan understands music enough to be able to tell...). 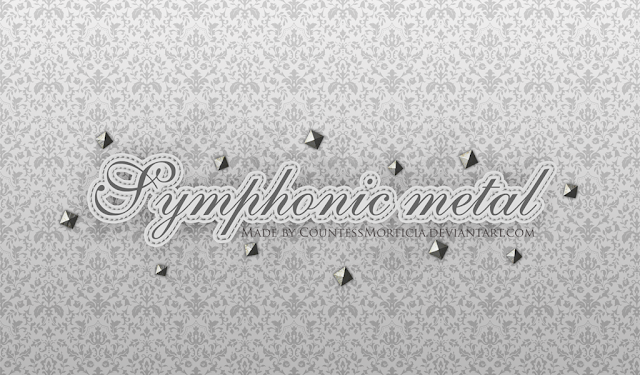 Of course, since you want to have your own SYMPHONIC metal band, you must use a SYMPHONIC orchestra in your songs - it will sound emotional and epic. And it will definitely sound artistic. Because, you know, whoever has something to do with orchestral music must also be a very well educated and great artist after all, so why not make yourself such an artistic image too? And don't worry, if there is no orchestra to record some orchestral accompaniment for your songs - key boards can do the job just as well! It won't sound that epic, of course, but it will do the job. And of course, if you want to compose emotional and regretful songs, you better use minor keys (like a-minor) in your songs. That's actually pretty logical and reasonable - songs in a minor key usually sound more sad and dramatic. Oh, and I've almost forgotten about the intro and interlude. Well, it must be in Latin, four-four or three-four time and each word or a syllable should be possibly timed on a crotchet or a quaver (quaver is just perfect). The intervals between notes should be one prima to make it more epic. Oh, and don't really bother with making your songs complex and interesting - composing complex songs is difficult and it takes a lot of time. Instead you can just make it chaotic - people won't be able to tell the difference! And it's not even important, because the most important thing is to compose epic songs. Maybe the complexity is not even that good - some people would probably appreciate it, but most people prefer catchy tunes. Now this is very important! Most symphonic metal bands have a female vocalist, meaning you need to get yourself one too. It's also necessary for her to sound like an opera singer and it doesn't really matter if she's actually an operatically trained vocalist. Again, people won't be able to tell the difference. But if you find some lady who studied operatic or classical singing (There is a difference, but it hardly matters, right?) at least for a year (Or a few months... Or one month … or half-drunkenly read a Wikipedia article), then good for you! At least you'll have an argument for those who'd say that your singer can't sing (even if your vocalist is clearly out of tune). But you can always use this argument (even if your vocalist is not trained at all) because whoever sounds like an opera singer can't be bad. Oh, I almost forgot (quite a habit actually)! Your female vocalist has to be a soprano! Possibly a dramatic soprano because they sound, you know, more dramatic and dark. No one likes lyrical sopranos because they don't sound dark and dramatic enough. Lyrical mezzo-sopranos are even worse because they are too soft and can't hit the highest tunes. 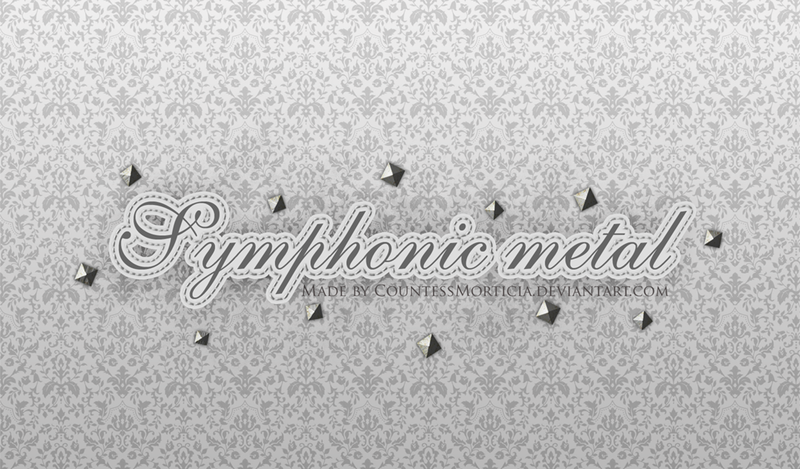 On the other hand, dramatic mezzo-sopranos aren't good either - yes, they sound dramatic and dark but just like the lyrical mezzo-sopranos, can't hit the highest tunes which is of grave importance for a good symphonic metal band! Yes, the pun was intended. There is also one more thing you have to know: people don't actually care about ranges and vocal types because they consider anyone who can hit high tunes a good singer. The poor souls who can't hit the high tunes are simply bad singers and have no place in the musical industry as they don't obviously have a good vocal range. To most people there are no vocal types so altos, mezzo-sopranos and sopranos should be able to hit the highest tunes - altos should be able to hit the same high tunes as mezzo-sopranos and mezzo-sopranos should be able to hit the same high tunes as sopranos. And even "better": altos should be able to hit the same high tunes as sopranos. And I don't even mention the coloratura vocalist (who can hit even higher tunes than sopranos)! That's because most people don't actually know anything about vocal types and ranges so to them mezzo-sopranos are worse than sopranos and altos are absolutely the worst... This is why you have to pick a (dramatic) soprano singer - people won't make fun of her singing and your band. Remember: She has to be able to hit the high tunes and sound dramatic and dark (hence the dramatic soprano)! As for your male vocalist (because it's always good to have one), the options are almost endless. If you want your band to sound really dark and heavy, so much so that even the black/death metal fans had no doubts about the quality of your band and its music, you can find a growler and ask him to join the band. However if you dislike growling, you can always hire a tenor singer who can hit even the highest tunes since to satisfy the popular demand. It might sound a bit like power metal but who cares? Or maybe you could find a singer with a really deep dark voice for your band - someone who could sing in a doom metal band because these bands are pretty dark. Just don't let him sing any faster and more dynamic songs - it'd spoil the feeling. Just like the lyrics, even the name of your band must be poetic and dark. It helps if the name only consists of one word but be careful - many of the good names are already taken and you want to be at least a bit original! If you can't find any, then you can make up some. On the other hand, very long names are quite good as well. A recommended pattern should go something like this: *Something* Of *Something*, for example "Tears Of Ophelia", "Tale Of Night" or *Adjective* + *Noun* like for example "Mirror Lake", "Crystal Rose" or "Dark Paradise". As you probably understand, it has to be poetic and dark. And there are only two languages you can use: English or Latin because Latin is cool! I'll try to make it short and brief: Long hair is necessary and females should dye their hair. Black, red or light blond are just perfect but dark blue or purple are just as fine too. Having the natural colour of your hair is out! As for clothes, it must be dark and gothic - men should wear dark coats, black (long-sleeved) shirt, and black trousers (jeans are tolerated, but they're not as good as simple black trousers). Women should go with either a black top that resembles a goth corset with laces, some nice shirt/top and an underbust corset or a corset and a skirt (black skirt with lots of layers and laces optional). A Black dress is fine too. Ah yes, and don't forget boots, metal accessories and eccentric make up!